All The Easter Eggs in DOOM PATROL GO! Much of Gar’s dreamscape is an animated tribute to the Cartoon Network series Teen Titans Go! The animation, backgrounds, voice cast, and music all come together to form an emotional tribute to the series. The cast of Teen Titans Go!, many of whom also have roles in Young Justice, lent their voices to the team members who best match their counterparts. Scott Menville, who plays Robin in Teen Titans Go!, for example, voiced the Chief. Robin and the Chief are both driven, calculated, non-super-powered, and the leaders of their respective teams. Khary Payton, who plays Cyborg in Teen Titans Go!, voiced Robotman. Cyborg and Robotman are both men who lost many of their vital organs in an accident and were forced to become part machine in order to survive. This sequence even has Robotman say, “Booya," Cyborg’s catchphrase on Teen Titans Go! Tara Strong, who plays Raven in Teen Titans Go!, voiced Negative Woman. Raven and Negative Woman both have the power to project “soul selfs” and leave their own bodies to become a being of energy for a limited period. Hynden Walch, who plays Starfire in Teen Titans Go!, voiced Elasti-Girl. Starfire and Elasti-Girl both have a nurturing nature, which makes each of them the emotional anchors of their respective teams. Greg Cripes plays Beast Boy in both shows. Believe it or not, this isn’t the first time Young Justice and Teen Titans Go! have crossed over. The Young Justice versions of Aqualad, Miss Martian, and Superboy appeared in the 2015 Teen Titans Go! episode “Let’s Get Serious”. In the episode, Aqualad chides the Teen Titans for slacking off and not being as serious as they are. The version of Megan who appears in Doom Patrol Go!, uses the same character model employed in “Let’s Get Serious." 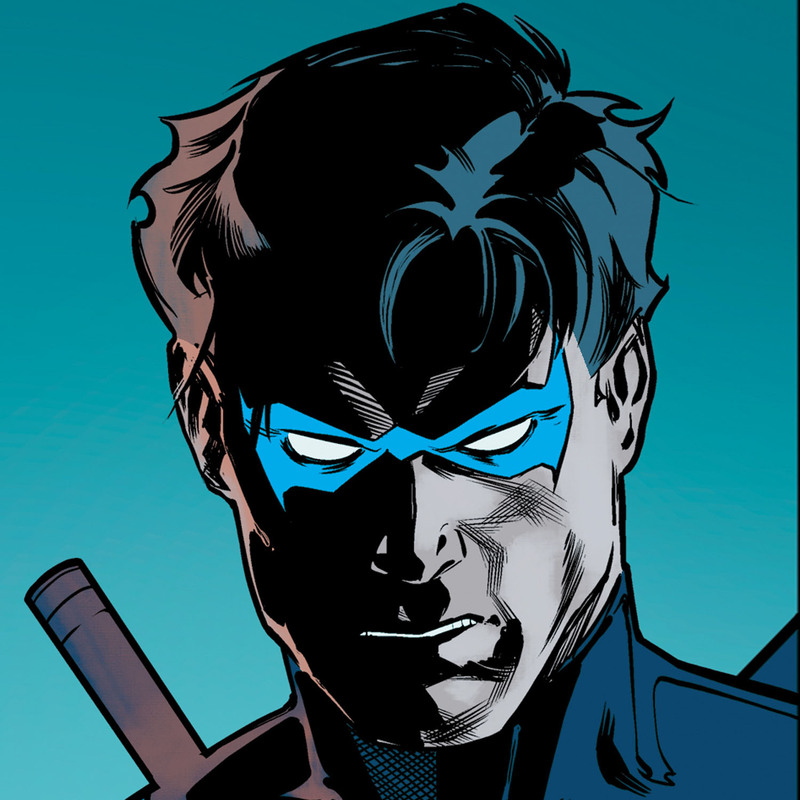 When Gar’s dream sequence begins, he finds himself fighting Klamulons alongside avatars of his deceased friends Ted Kord, Jason Todd, Tula and Wally West. 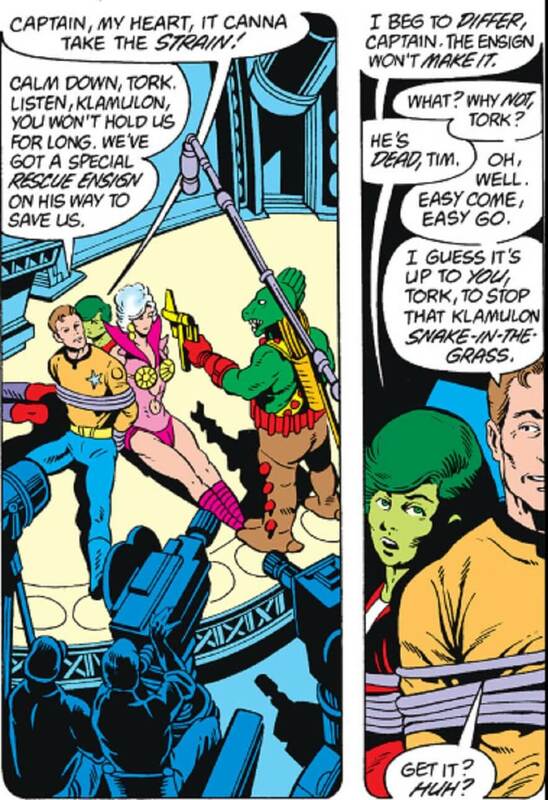 We had previously seen the Klamulons when Gar was filming Space Trek, and, believe it or not, these creatures originated in the comics. 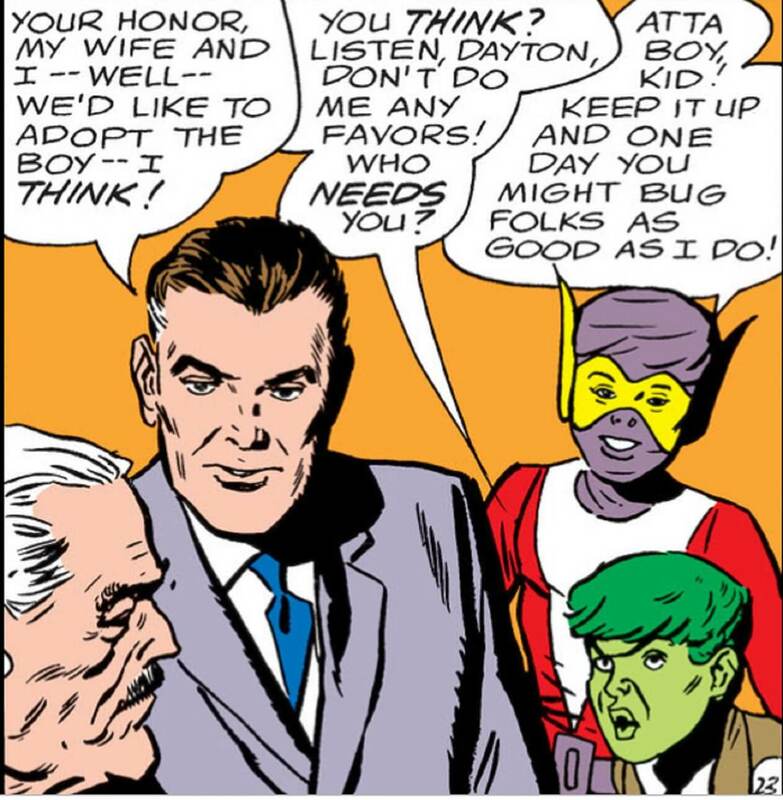 The Klamulons were first mentioned when Gar’s acting career was introduced in Teen Titans #50 (written by Bob Rozakis and penciled by Don Heck). We even got to see an actor playing a Klamulon in Tales of the New Teen Titans #3 (written by Marv Wolfman and penciled by George Perez). Tork’s catchphrase, “He’s dead, Tom," is similar to the one he had in the comics, “He’s dead, Tim." Both versions are an homage to Dr. McCoy's catchphrase in Star Trek ("He's dead, Jim"). Speaking of death, some fans have pointed out that Wally is the only “dead crew member” who isn’t killed by the Klamulons in Gar’s dream. Does this mean there is hope for Wally? Could it be he’s not really dead?! In this episode, we get to meet Gar Logan’s guardian Steve Dayton, and it’s clear their relationship isn’t a strong one. Steve Dayton first appeared in Doom Patrol #91 (written by Arnold Drake and penciled by Bruno Premiani). Steve Dayton was an eccentric millionaire who used his fortune to build a mind-enhancing helmet, which allowed him to become the superhero Mento. Steve had done this so he could win the heart of Elasti-Girl, who was initially reluctant to return his affections. When Steve Dayton met Gar Logan in Doom Patrol #102 (written by Arnold Drake and penciled by Bruno Premiani), the two instantly disliked one another. Steve finally convinced Rita to marry him in Doom Patrol #104, and hoped his new bride would retire from crime-fighting to focus on being a housewife. Rita had her own ideas, however, and remained with the Doom Patrol, much to her husband’s annoyance. One of the more emotional moments of Gar’s dreamscape involves Rita telling the boy that she will take him in now that he’s an orphan. This is another plot point taken from the original Doom Patrol comics. 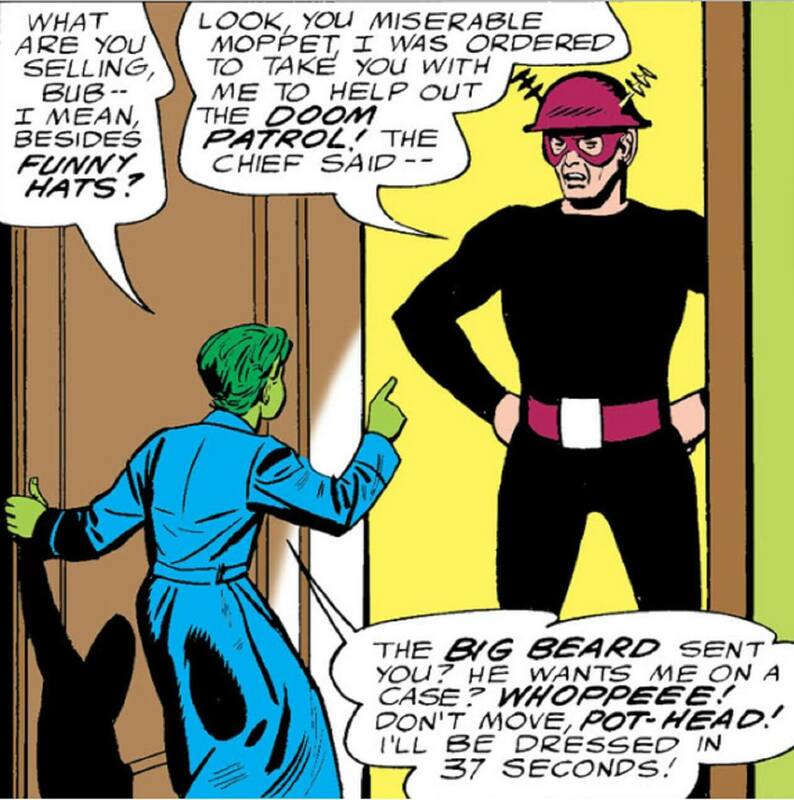 When Beast Boy first met the Doom Patrol, Rita was one of the few members who was sympathetic to him. Gar told the team about his cruel guardian Galtry, who had only adopted him to take advantage of his inheritance. Although some of the Doom Patrol thought Gar had been making the story up for sympathy, Rita’s heart went out to him. She convinced her husband Steve to use his wealth to wage a legal battle against Galtry. In Doom Patrol #110 (written by Arnold Drake and penciled by Bruno Premiani), Galtry’s crimes were exposed and Gar was removed from his care. Realizing that Gar still needed parents, Steve hesitantly petitioned the courts to adopt him. Although Steve had grown to care for the boy, there was still a distance between them. While Gar considered Rita a mother, he constantly referred to Steve as his “stepfather”. 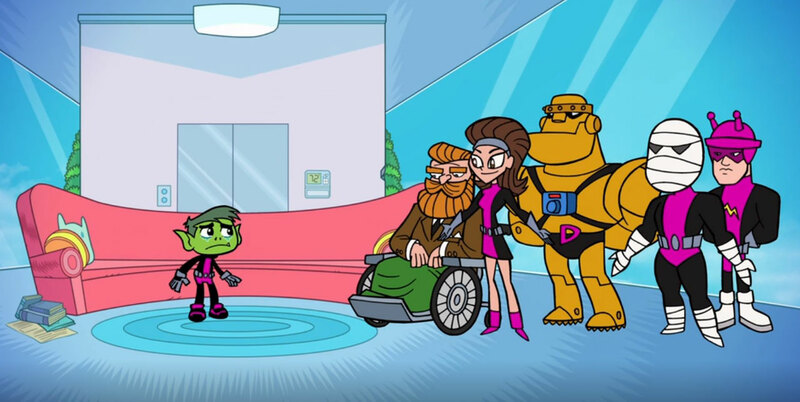 As the animated versions of the Doom Patrol sing their theme song, Beast Boy tries in vain to keep them from going on the mission that is doomed to end their careers. In the comics, Beast Boy’s first team went on their final mission in Doom Patrol #121 (written by Arnold Drake and penciled by Bruno Premiani). General Zahl and Madame Rogue capture the team on a small island and present them with a difficult choice – save themselves or save a small fishing village of 14 people. Zahl held a detonator for each location, intending to use this exercise to prove the Doom Patrol’s cowardness to the world. To Zahl and Rogue’s surprise, the team chose to save the village and sacrifice their own lives. Beast Boy and Mento, who were not full-fledged members of the team, had not participated in the mission. They survived and mourned their fallen friends. Although each team member would wind up getting revived years later, the experience of losing his second family left heavy emotional scars on the young Garfield Logan. 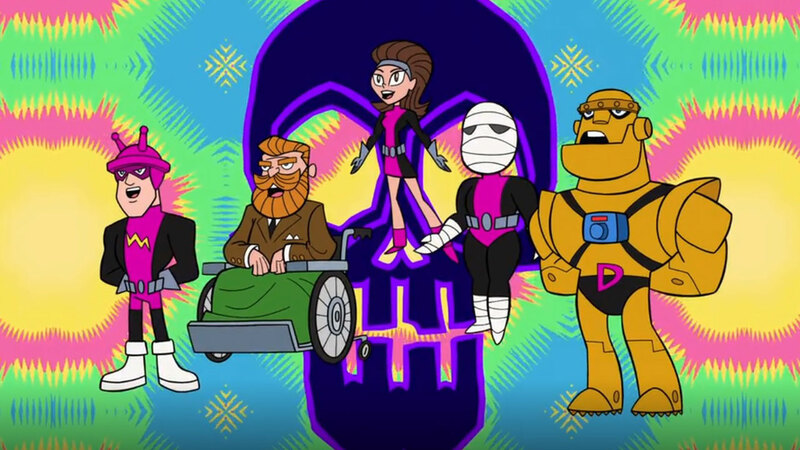 While the Doom Patrol is singing about their final mission, the background briefly resembles imagery used in the marketing of the 2016 DC film Suicide Squad. The brightly colored skull and the multi-colored background were seen in lots of posters and other promotional material for the movie. The tribute also works as a pun, since the Doom Patrol’s mission puts them in the position of being a literal “suicide squad." During Gar’s horrifying dreamscape, he was forced to relive the death of his mother Marie Logan. Readers familiar with the canonical tie-in comic might remember the scene from Young Justice #25 (written by Greg Weisman and penciled by Chris Jones). 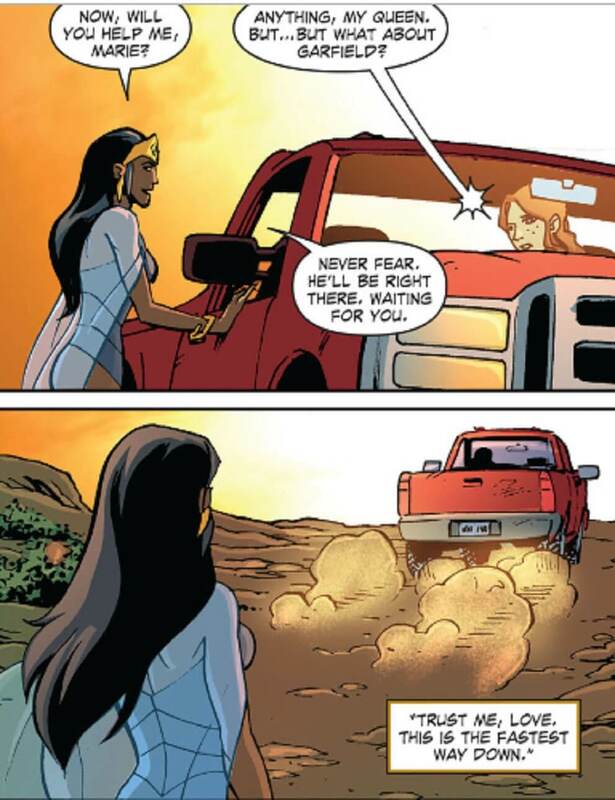 Seeking revenge, Queen Bee mentally controls Marie and forces her to drive her jeep off a cliff. The giant waterfall in the backdrop is similar to the one Marie’s comic counterpart fell to her death from in Doom Patrol #100 (written by Arnold Drake and penciled by Bruno Premiani). Although that death was due to a natural disaster (a tropical monsoon), it didn’t make it any less tragic for poor Gar. For more, be sure to watch the latest episode of Bringing Back Young Justice with Whitney Moore -- "Recording Doom Patrol Go!" Or read our coverage of the other Easter eggs in the "Nightmare Monkeys" episode of Young Justice: Outsiders. To learn more about Gar Logan’s history with the Doom Patrol, be sure to check out the original Doom Patrol comics here, and stay tuned to DC Universe this February for the debut of the Doom Patrol live-action TV-series! What did you think of Doom Patrol Go!? Let us know in our Community!